I like to fry and cook cubed bacon for various dishes, but I sometimes have a hard time cutting through bacon, especially where the fat meets the meat. The bacon just tends to move around too much, and it gets trickier at the end of the slice (or chunk). I usually use a 6 inch serrated knife for this task. What knife would be best - serrated, chef's, or filet? Or something else? Is there some special technique I should be using? Don't use a serrated knife. It'll be easier to cut with, but it will shred and fray the bacon as you slice, eventually making a mess. 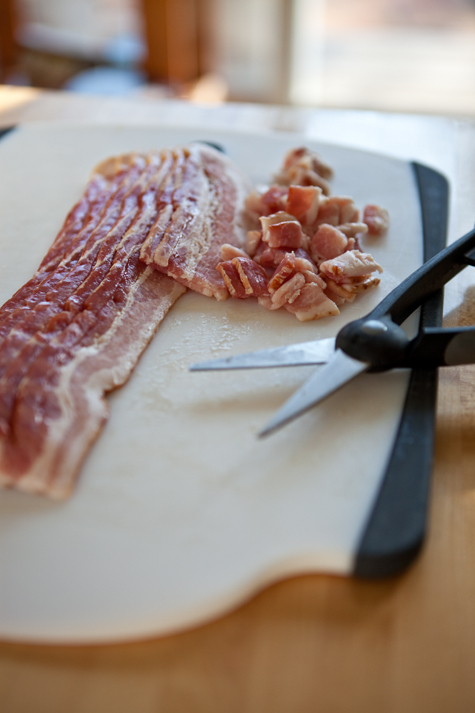 Use the sharpest knife you have, especially for uncooked bacon. There's already a tendency for it to slip and slide around, and a sharp knife cuts with less back-and-forth motion. You want a deep-bellied knife such as a santoku or Chinese cleaver, because you can slice through multiple stacks of bacon at once. Stack slices of bacon so you can cut multiple pieces at once. Organize your cutting board. Pick one corner for whole chunks of bacon, then cut into strips and move to another spot, then finally into cubes which goes in another spot. Now if I were a culinary school, you'd have paid a few hundred bucks to learn what I just told you. I first remember seeing Melissa d'Arabian demonstrate using KITCHEN SHEARS to cube bacon during her season on "The Next Food Network Star". I tried it soon after and I find that the scissor action of the shears makes it EASY to cube bacon. Clean, consistent easy to use. I would say a chef's knife, for sure. Make sure it's sharp! If you've never sharpened your knives (not just honed using a steel) it can make a world of difference. If you are having troubles, making sure the meat is chilled will help. Straight out of the fridge works okay, but it is even easier if you throw it in the freezer for 15 minutes or so. Guess I should mention one trick: put them in the fridge/freezer for a while ... simply because fat on low temperature is way more easy to handle. Not the answer you're looking for? Browse other questions tagged knives bacon knife-skills or ask your own question. Can bad honing technique spoil a knife?